After penguin and panda, Google has introduced one brand new pet in their zoo named Hummingbird. This Google algorithm update has created a lot buzz all over the SEO world, and professional content marketers are already doing their best to tackle and adapt for this new update, this new search algorithm has brought on many ups and downs that search engine marketers shocking if their content creation strategies might be affected. Below 4 infographics will take a review that what is Google Hummingbird and why content marketers should focus from keyword search to user-intent search. Relatively harmless to "Low ranking/authority" websites. Very Helpful with quick information SERPs. Semantic search rather than keyword search. More than 60 percent of adult cell owners now use their Smartphone to go online. While 34% of those adults prefer to go online with their phones. Shift your focus from keyword search to user-intent search - Keywords query to voice command. Include more entrance pages to your website with blogs or other creative opportunities. Create helpful content aimed toward mobile users that easily answers questions. 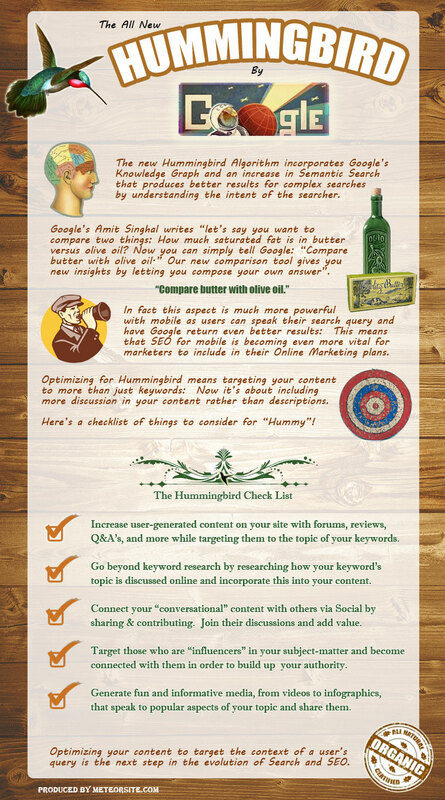 Worry less about branded links, Hummingbird responds better to quality content. Claim authorship of your content. The new Humming bird algorithm incorporates Google's Knowledge Graph and an increase in Semantic search that produces better results for complex searches by understanding the intent of the searcher. "For example you want to compare 2 things: How much saturated fat is in butter versus olive oil? Now you can simply tell Google: "Compare butter with olive oil". Our new comparison tool gives you new insights by letting you compose your own answer. In fact this aspect is much more powerful with mobile as users can speak their search query and have Google return even better results: This means that SEO for mobile is becoming even more vital for marketers to include in their online marketing plans. Optimizing for hummingbird means targeting your content to more than just keywords: Now it's about including more discussion in your content rather than descriptions. Here's a checklist of things to consider for "Hummy". 1. Increase user generated content on your site with forums, reviews, Question and Answers, and more while targeting them to the topic of your keywords. 2. Go beyond keyword research by researching how your keywords topic is discussed online and incorporate this into your content. 3. Connect your "conversational" content with others via social media by sharing and contributing. Join their discussion and add value. 4. Target those who are "influencers" in your subject-matter and become connected with them in order to build up your authority. 5. Generate fun and informative media, from videos to infographics, that speak to popular aspects of your topic and share them. Name Humming bird: This update is the biggest change to search since Caffeine in 2010. It derives its name from being precise and fast. Its purpose: is to praise full questions (instead of word-by-word); find meaning behind the search string to provide better results. When did it release: Google Hummingbird Rolled out September 2013.
Who will it affect: 90% of searches worldwide will be impacted. What is it's future: Google made updates/changes to its old algorithm 500-600 times each year; this is a new algorithm that will continue to have changes/updates. Impact on SEO: This Algorithm incorporates many factors from the old algorithm. real, original, relevant and useful quality content will matter eve more now. 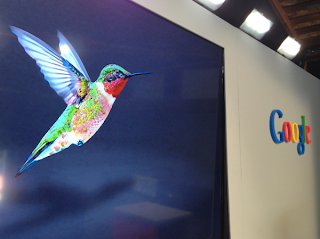 Google Humming Birds - What's it all about? Humming bird gives more weightage to those posts, webpages and blogs which have good number of +1s, retweets, repins, likes and more.